This monster is the cover card for The Lost Millennium. This monster has a retrained counterpart: Ancient Gear Golem - Ultimate Pound. This monster has a Toon counterpart: Toon Ancient Gear Golem. This monster has a crest on its helmet resembling a Roman soldier. The Romans built great war machines that were powered by gears. As one of the original three Ancient Gear monsters (along with Soldier and Beast) its ATK is equal to its DEF. This monster is based on a golem, an animated guardian made from earthen materials. In the anime, this card is so extremely rare that by the time Yu-Gi-Oh! 5D's is set in, the card hadn't been seen in living memory until it appeared in the episode Lessons Learned. Its rarity is such that it is often referred as a legendary card, which is also attributed to being considered overall as a very powerful card. This monster appears in the artworks of Stonehenge Shield, Ancient Gear Scrap Fusion, Ancient Gear Catapult, Ancient Gear Inspection, and Cross-Dimensional Duel. Some prints of this card in the Spanish TCG show its name as Golem de Mecanismo Antiguo, while some show it as Gólem de Mecanismo Antiguo. The icon for Machine-Type monsters in Yu-Gi-Oh! 5D's Duel Transer is based on this monster. The "If this card attacks, your opponent cannot activate any Spell/Trap Cards until the end of the Damage Step." effect is a Continuous Effect. If "Ancient Gear Golem" is destroyed by battle, the "your opponent cannot activate any Spell/Trap Cards until the end of the Damage Step." effect is no longer applied. Even if this effect of "Ancient Gear Golem" is being applied, the effects of face-up Continuous Trap Cards can still be activated. You can activate "Spell Gear" if you have 1 copy of "Ancient Gear Golem" in either your hand or Deck. You can activate "Spell Gear" if you have 1 copy of "Ancient Gear Golem" in both your hand and Deck. You cannot activate "Spell Gear" if you have no copies of "Ancient Gear Golem" in either your hand and your Deck. 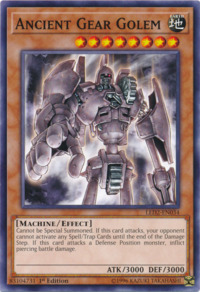 : For "Spell Gear", if you have an "Ancient Gear Golem" in both your hand and Deck, can it not be activated? "Inferno Reckless Summon" may be activated if your opponent only controls monsters like "Ancient Gear Golem" or "The Wicked Dreadroot" which cannot be Special Summoned. When resolving "Inferno Reckless Summon", your opponent cannot select a monster that cannot be Special Summoned, so only your monsters will be Special Summoned. : Can you activate "Inferno Reckless Summon" when your opponent only has monsters which cannot be Special Summoned on his side of the field? If “Ancient Gear Golem” attacks, the effects of Spell or Trap Cards that are already face-up can still have their effects activated, like “Ultimate Offering”, “Royal Oppression”, or “Skull Lair”. However, face-down Spell or Trap Cards cannot be activated (flipped face-up), including a face-down “Ultimate Offering”, etc. The effect of “Ancient Gear Golem” that prevents your opponent from activating Spell or Trap Cards is a Continuous Effect. It cannot be chained to. “Divine Wrath” cannot be activated against it. If “Ancient Gear Golem” attacks, and is destroyed before the end of the Damage Step, its effect is no longer applied after it is destroyed, even if it is still on the field and has not yet been sent to the Graveyard. (A Continuous Effect is no longer applied after the monster generating it has been destroyed, even if the monster is still on the field.) The effect of “Ancient Gear Golem” is applied up until the point it is destroyed, though. Jetroid: If "Ancient Gear Golem" attacks "Jetroid", the controller of "Jetroid" cannot use its effect. Geartown: While "Geartown" is active, you can Tribute "Ancient Gear Castle" with 1 Counter to Tribute Summon "Ancient Gear Golem". Spell Gear: You cannot activate "Spell Gear" if you do not have any "Ancient Gear Golem" remaining in your Deck. Spell Gear: If an effect is chained that prevents you from Special Summoning "Ancient Gear Golem", you still cannot Normal Summon or Set until the end of your next turn.